It’s entirely too easy to read too much news and miss important stories. PoliticoTracker for the iPhone and iPod touch is a promising app that lets you pick your poiso… er, politician and sort news and information. All Politics Is Local: With politicoTracker, you can keep tabs on politicians—say, your representative in Congress—sorting relevant stories by events, industries, agencies, or publications. The question that should spring instantly to mind is: Wait, doesn’t Google already do this? It’s certainly true that you could set up Google News Alerts for your favorite politicians and let the news flow freely into your e-mail in box. The next question is: What does politicoTracker do that Google does not? Translated from jargon-to-English: The app sorts in ways that Google simply cannot. And it sorts in fascinating ways. PoliticoTracker lets you sort the news about your pol by business events, industries, states, world news, government agency, or publication. So I can read all about my congressman’s work on forestry policy, or his efforts on behalf of World War II veterans who were held prisoner at the Berga an der Elster slave labor camp and whose story was mostly unknown until recently. The app draws on a range of sources, from local newspapers to public relations newswires. The interface is spare, not-at-all lovely, but more or less easy to navigate. You can browse for the politician you want to follow or tap the search window and type the name (or part of the name) of who you’re looking for. It isn’t obvious at first, but the cartoon icon at the top left of the screen is the favorites list. Tap it, and up pops the list of pols you are following. When you tap on a headline, politicoTracker only displays an excerpt of the story. You can save the excerpt to read or refer back to later, or tap on the publication link—politicoTracker will open the story in the app. I don’t like the cumbersome additional step of clicking on a URL link to read a story. Most of the story excerpts are useless. If the idea is to let users have a taste of a story if they happen to be online, then the excerpts are simply too short to fulfill that purpose. You need to click through to the news source anyway. On the positive side, if a story won’t load in the app, you can tap a button to open the article in Safari. PoliticoTracker has other limits, as well. It only lists federal officials and certain cabinet secretaries, such as President Obama, Vice President Joe Biden and Attorney General Eric Holder, U.S. senators, congressmen, state governors, and state representatives. Isn’t that enough? Not really, no. In California, for example, Attorney General Jerry Brown is suing industries left and right in the name of consumer and environmental protection. And, incidentally, Brown has all but declared his candidacy governor next year. Come to think of it, with California headed for a fiscal catastrophe, it would be nice to follow news about Controller John Chiang and Treasurer Bill Lockyer, too. I’m sure readers in other states could make similar suggestions. 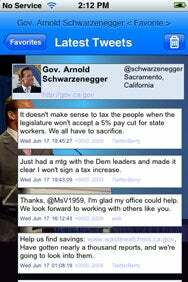 I'll Be Back... on Twitter: The Twitter Edition of politicoTracker lets you follow the tweets of politicians, including the current governor of California. But I also found, to my disappointment, that politicoTracker for Twitter won’t let me share any of my discoveries. I can’t e-mail from the app, or share it with my Facebook or Twitter pals. And the app is almost as incomplete as its companion. I know for a fact that aforementioned statehouse aspirant Jerry Brown is tweeting like crazy in California, as Jerry Brown is wont to do. Yet you wouldn’t know it from politicoTracker’s list. Makes me wonder which other politicians, dead or alive, might be missing. PoliticoTracker is compatible with any iPhone or iPod touch running the iPhone 2.1 software update. The Twitter Edition version runs on iPhone 2.2 or later.